Guidebook describing challenging treks in the mountains of Greece, traversing the Pindhos Range, near Athens, and the Peloponnese, plus a handful of shorter routes including Mount Olympus. The treks demand a high level of commitment and fitness due to their remoteness and difficult terrain, and boast stunning unspoilt scenery. June-Sept is the most settled period for weather, and not too hot in the mountains; snow Nov-April in the mountains. 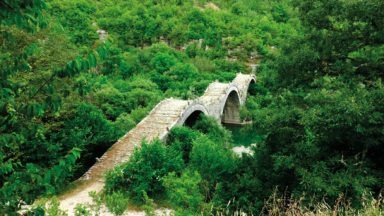 This guidebook presents four specially devised treks in the mountains of Greece, showcasing its beautiful scenery, rich flora and cultural interest. The Peloponnese Way crosses the Peloponnese peninsula from Dhiakoftó in the north to Pantazí beach in the south, via Trípoli. Taking in alpine meadows, a dramatic gorge and forest-clad slopes, the 220km route can be walked in around a fortnight. The 460km Pindos Way is a south-north traverse of Greece's mountain backbone, and can be walked in a month, or split into sections of around a week. 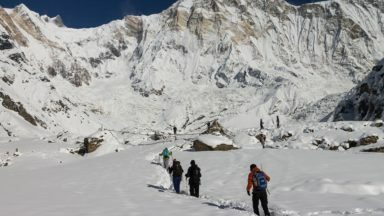 With remote terrain, navigational challenge and fewer facilities on route, it is the toughest of the four treks but offers a unique chance to experience both the country's wilderness and traditional mountain life. 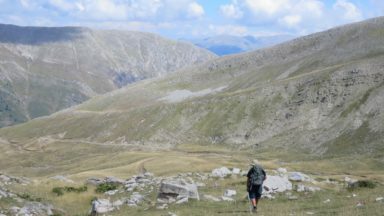 A shorter 80km Zagóri trek can be enjoyed in its own right or incorporated into the Pindos Way, and the final route explores Mt Olympus, home of the ancient gods of Greek myth and the highest mountain in Greece. With clear mapping alongside detailed route description for each stage of the treks, as well as background information about the region and a Greek-English glossary. The creation and maintenance of of the Pindos Way is an ongoing project. Local people are beginning to take an interest in the Pindos Way and in clearing and maintaining old networks of footpath. The author has sent in some improvements to the published route (such as eliminating sections of tarmac). Turn L up the road past the shrine for 50m. Just round the R-hand bend a rough path turns up L into the juniper scrub and follows the crest of the rounded spur threading through the bushes. Slightly below to your R are the remains of fields still neatly terraced with big stones. Keep up the L edge of these terraces, without dropping down the slope to your L. You can see the road over to your R. In 15min you rejoin it beside a large and isolated wild pear tree (gortsiá). Turn L and follow the tarmac up towards a row of conspicuous tooth-like rocks on the ridge ahead (10min). Immediately over the col, between two shrines, descend R on a track that quickly doubles back L into and across a stream gully. Climb the opposite flank on a section of old kalderími to join a further track running across the slope above you. Bear L and rejoin the tarmac on the edge of a fenced walnut grove (10min). 100m later you come to the beautiful spring of Áyios Nikólaos under a plane tree beside the road (2hr 20min). Out of sight just behind it is a small chapel: a possible campsite. If the spring is dry, the powerful year-round Kría Vrísi is just below the road L 200m further up. A much more interesting and perfectly do-able route, it requires four short river crossings in water no more than two feet deep in summer. Head N out of Sikiá on the tarmac. At the second L turn, just after a big concrete water tank on the R and a flat grassy area with benches on the L, turn L down a zigzagging track to the village cemetery (45min). The track continues (ignore a R turn) for another few hundred metres and ends on the edge of the plane-covered shingle banks of the river Mórnos (1hr). Push through the first band of trees and head 320ºNW, following the sandy stretches between the small scrubby planes for about 10min. Emerge on to open shingle and cross the river at the N tip of a small shingle island. Climb out on the opposite bank (E00344281 / N04280594) and turn R for 60m. At the plane-lined gully of a tributary stream coming down from the L, cross over and climb diagonally up a stony path into an open ‘field’. Continue across the field keeping close to the river bank. In 5 or 6min a clear path close above the river bank funnels you down into a large flat field with walnut trees (E00344120 / N04280335). Cross it keeping to the foot of the slope L. At the end you are squeezed down through dead broom to the water's edge (E00344213 / N04280408). You cannot continue on this bank; the way is blocked by a couple of rock outcrops. Cross the river and continue upstream on the shingle opposite until it is possible to cross back to the true R bank. Again continue upstream on the shingle, keeping to as straight a line as you can, through the scrub and dwarf planes that back the shingle. You will see the low, broken remains of a wall; keep on the river side of it (E00344257 / N04280639). I have placed some streamers and red paint marks. The path, while quite clear much of the time, has become more a cow than human path. After 5 or 6 minutes the path draws nearer to an earth bank L bordering the flat bottom of the riverbed. At E00344319 / N04280923 clamber steeply L up the bank and R into an open grassy ‘field’. After a short barrier of kermes oak trees (E00344399 / N04281436) you cross another stretch of ‘field’ (5min), keeping on the contour, and enter a stretch of scrub on a clear path. The river all the while is only 40-50m below R. Cross a further patch of ‘fields’ (2hr), keeping along the top edge. At the end on the R is a big rock (E00344082 / N04281570; 597m). Enter the scrub and a few paces later cross a stream gully. A moment later, on what looks like the remains of a path (00344075 / N04281605; 597m; 2hr 10min), leave the clear path you have been following and bear R down towards the river. You have to push through the trees the last few metres to reach the river bank (E00344074 / N04281692; 588m). NB Sikiá (at the beginning of the route) has a ksenónas but it is invariably closed. If you want food or any kind of help, ask Vasílis Békos at the magazí right on the road in the middle of the village by the church (mobile 6974810642; he can manage a bit of English and is extremely helpful). 100m past the Sélo turning, on top of the earthy bank R, there is water from a spring feeding a cattle trough (E0294437 / N04325-69; 1093m). Cross the bridge (E0029860 / N04331591; 441m; it is incidentally possible to get here by walking up the Agrafiótis riverbed in about 1hr from the road bridge at Karvasarás). Ignore what appears to be a clear path heading upstream L on the stream bank. Instead turn R off the bridge and hard L round the end of the rocky spur barring the way ahead. Immediately on the L you will see the start of a beautifully graded cobbled path zigzagging up the spur. Higher up it crosses L of the spur and begins to level out along the slope above R bank of the Ftéris stream through poornárya scrub and oak. At E00292857 / N04331774 (480m) you pass a first ruined cottage beneath plane trees and shortly after a second one (4hr). 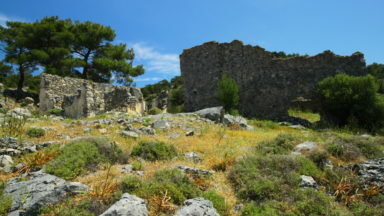 These are the ruins of the settlement of Anifóra, the last of them abandoned only about 20 years ago. Hard to believe today, but there were once enough children to warrant a primary school. Shortly after, by a third ruin (4hr), turn sharply R and up into the woods, mercifully in the shade – for the climb is steep – following a long series of zigzags where the path is still clear and the cobbles visible in many places, until you come to a bit of open grassy clearing close to the edge of the near vertical slopes dropping down to the Agrafiótis. Here the path peters out, obscured by the red gritty earth of a small landslip (E00292855 / N04332020; 596m). The old path swings R across the top of the first gritty red patch, round to the R and back L to cross the lower edge of the higher patch of grit, where you soon pick up the clear line of the old zigzags. If you cannot find this, it might be easier to bear diagonally L towards the upper edge of the clearing, avoiding the red grit, on a faint path that climbs through the trees to another small grassy clearing in 3 or 4min. Here you bear 90º R and up and keep bearing R until you come once more, in just a few metres, to the old path on a clear R-hand zigzag (E00292874 / N04332125; 651m; red paint and streamers). At E00292916 / N04332095 (684m) you emerge in the open on the outer edge of the spur you have been climbing with a clear view down to the Agrafiótis. A few minutes later you come once more to terrace walls and ruins – the former settlement of Foukariátsa (E00293035 / N04332181; 758m; 4hr 45min). The path climbs at a gentle angle following below these walls to reach the edge of open, grassy, fairly level ground that once was fields (E00293062 / N04332320; 786m). At the uphill end of these ‘fields’ is a steep rocky spur up which the old path climbs. From the cairn in the middle of the slope before the trees (E00293094 / N04332419; 818m) you can see an old wooden telephone pole with the insulators still in place. The stony path climbs up here, switches back and forth among scattered kermes oak (E00293015 / N04332219) before finally bearing R to pass just above a small white chapel at the spot known as Élatos (E00293158 / N04332296; 5hr 30min). There is a terrible plan afoot to build a line of 200 or so wind turbines all along the eastern ridge of the Ágrafa facing Epinianá. This is an act of sacrilege, just like the now-abandoned scheme to divert the waters of the river Akhelóös (see page 154). There are plenty of other places to build wind turbines, places which do not have the historical associations of Ágrafa or the exceptionally beautiful topography. Wind turbines will not bring money to the dying villages. 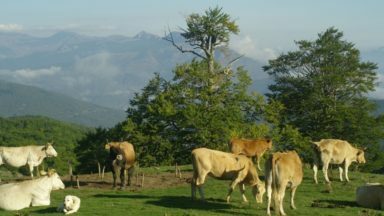 Sustainable tourism, like hiking the Pindos Way and other outdoor activities, will. It is roughly 3hr to Kalí Kómi, including unavoidably – for the moment, at least – 7km of tarmac. There is next to no traffic and the road is narrow and getting narrower as bits of tarmac fall into the ravine below every year. The consolation is some wonderful views into the deepest and narrowest ravine in all the course of the Akhelóös. The first half hour is on the old path. It starts just uphill from the magazeé, To Monopólio. Go up the stone steps beside a newly restored cottage and L round the back of it. In a moment you come out on a dirt track by a wooden electricity pole among the last houses. To the L is a new house. A narrow overgrown path runs up the R side of it. At the top clamber up over a ruined wall towards a big tree to join a not very clear stony path which heads diagonally L uphill beside a crumbling terrace wall through what is at first fairly open ground. It then tunnels into patches of poornáree scrub. The line is pretty much straight (just N of W) and fairly obvious all the way (red streamers). Do not lose height towards the L. You are heading towards a low saddle with a tiny bus-stop-like chapel close to an electricity pole on the top – Ái Vlási. From here head diagonally L and down to join the tarmac, where you turn R for Kalí Kómi. The road winds in and out of various re-entrants, past a few still-occupied smallholdings clinging to the steep slopes of the Akhelóös gorge. As you wind up the last slopes before Kalí Kómi you will see a number of primitive old stable buildings under the trees. Right on the col, on the R, is a whitewashed chapel. Leave the tarmac here and turn R across a patch of ground messed up by road construction. 40m in on the L under overhanging branches you will find the clear line of the old path descending the slope towards Kalí Kómi in a more or less straight line. When you first see the road again, do not go down on to it, but follow the stony path where it bends clearly R and down along a wire fence. The second time you hit the road, follow it down R for a few metres to the next hairpin where you turn off R on a clear line beside a metal water pipe. It brings you out among the first houses of Kalí Kómi (about 20min from the col) where the road levels out and leads to the church and magazeé (5min). For the magazeé turn R up the stone steps beside the church. The magazeé is on the terrace above overlooking the surprisingly lush valley, whose ancient fields have now been largely swallowed by encroaching nature. The centre of village social life, it opens around 7pm, serving drinks, souvlákia and salads. Vasílis Kotsónis, who runs it, is a friend; show him this book and he will be only too pleased to help you. Pass the magazeé which looks over the church and plateéya and follow the tarmac L out of the village. Almost immediately, a path turns up R between the last two houses. Past a stone cottage L, bear up slightly R beside a fenced enclosure to emerge on to a track. Turn L towards a new house. Just before it a path bears up diagonally R to come out by a fenced enclosure (5min) and, behind it, two concrete water tanks. A grassy track bears R and back L above them to join the main dirt road by a large map on a L-hand bend (10min) by a scooped-out earthy area. On the further edge of this area turn up 90º R and head up through the scrub – the line of the path fairly clear – to hit the dirt road again on a L bend in 15min (1hr 55min). Be careful not to go hard R on the dirt road to Katoúna, but continue diagonally up R on another dirt road for 40m or so. Immediately after the sharp L bend in front of you, head off R up a path across more open ground to reach the grassy col below the Mavrovoúni peak by a concrete trig point (2hr 5min). Here you meet the dirt road to Valkáno again. The big peak across the ravine to the north is Mt Khadzí (2038m). At your feet the ground drops away into a grassy amphitheatre where the old path to Polinéri, the village you can see at the foot of Khadzí, began. Turn R and follow the dirt road round the head of this amphitheatre to the col opposite. The peak you can see to the north is Avgó (2148m). Stay on the road; it is a rough little-used track which winds down through beautiful fir forest for about 6.5km to the nearly deserted village of Valkáno. As you come to the beginning of tarmac again, bear up R to the village magazeé (3hr 30min). To continue to Moskhófito you can either follow the tarmac down to the bridge below Valkáno and walk the tarmac all the way (6km; about 1hr 30min) or continue uphill past the magazeé to join a dirt track which will take you out to the main tarmac road (3km) connecting Moskhófito and Mesokhóra, where you turn L down the hill to reach Moskhófito in about 30min (3km on the tarmac; around 1hr 30min altogether; 5hr from Kalí Kómi). The friendly magazeé in Moskhófito can feed you and possibly arrange somewhere to sleep. There is plenty of room to camp. The Hotel Akhelóös is clean, pretty and friendly. Mikhális, the owner, is happy to drive people to Gardhíki or anywhere else within reason. The route heads W from Mirófilo, then N up the ravine that leads to Alamáno where the Mirófilo flocks had their summer pastures and up over the Vromerí ridge, turning the west flank of Mt Khatzí, on the way down to Mesokhóra. Leaving Mirófilo, follow the tarmac down W from the plateéya and bear up R at the fork shortly after. Continue for about 1.5km to a plane-shaded spot known as Neráki where a spring runs out of a pipe low down, close to the ground, on the R (25min). A concrete ramp forks R and uphill (E00268494 / N04360881; 778m). The concrete gives way to dirt and this is now the shepherds' track most of the way to Alamáno. The old path is however still findable and much shorter. 200m up the concrete road there is a modern house on a R hairpin. Just past it the road bends L again. At or just after the bend, climb R up the eroded gritty bank on to a flat-topped stony spur. Bear L and up through open kermes oak (red paint and streamers). The way is reasonably clear, the direction between NNW and N. 10min bring you back to the road, now dirt, just above a second house (40min). Cross straight over and on up. Cross the track again in 10min and keep straight up. 10min later you meet it again. Turn R. Just round the next bend you come to a wide flat grassy space on the R known as Livádhi (meadow) with an ancient rotting orange Lada car and a big wood of fine plane trees behind it (1hr; E00268377 / N04361234; 913m): a great campsite except there is no water to hand. The track bends R into the grove of planes. On the L the ground is thickly covered with bracken. Just round the R bend, where there is no longer thick bracken covering the ground, bear L off the track at 325º among the huge and widely spaced planes, passing two very large rounded boulders. After 100m, bear gradually L to come out on the edge of a grassy clearing (5min). Cross it and come to the eroded bank of a deepish gully. Make your way diagonally down R into the gully and L up the opposite bank. At the top of the slope turn nearly 90º R through bracken and open trees. Ahead you can see the old stone embankment supporting the path as it climbs L and then R to come out on a subsidiary dirt track. Go straight across and up to join the main track in 50m (1hr 25min). You could either now keep on the track all the way to the end or follow the old path just below it as far as the locality Tsaoús. For the old path option, keep on the track until about 50m short of some plane trees shading a peculiar tin contraption protecting a water pipe. Bear off L on the contour on a fairly clear path which passes below this contraption. To your R are terrace walls topped with kermes oak and bordered by a wire fence. All this ground was terraced and cultivated within living memory. The path climbs gently. After about 10min you pass below a tin-roofed hut. You can either continue for another 10min or so on the same bearing until you come to the old terraces at Tsaoús (1hr 45min) where you can see into the start of the ravine that leads to Alamáno (fantastic view; great campsite; the track is about 80m above you here) or turn up 90º R immediately after the tin hut and climb up through the old fields, here wet with seepage, to the spring and water storage tank (E00267742 / N04361796; 1095m; 1hr 35min) on the track above. There is a big old oak tree just before you reach the track which would make a good campsite. 10min further up, the track bends sharply R (1hr 45min) to follow the R flank of the Alamáno ravine. From the corner you can see two shepherds' huts on the slopes at the head of the ravine. From the Mavrovoúni refuge above Métsovo to Samarína, four days to the north, the path has been completely cleared and freshly waymarked (Ursa Trail and E6 red on yellow squares), making navigation of this beautiful section of the route a doddle. As of July 2018 there is no need to leave Dhístrato by the tarmac road. The E6 path starts right in front of the Pafilis's Briáza magazeé. Go down the cobbled ramp and turn R at the bottom (50m), following the street and the E6 red and yellow squares round the side of the village and out across the eroded friable slopes of a big stream gully until you reach the tarmac by a fish farm. Turn L up the road for 200m. On the first R-hand hairpin the path starts again, leading up through the young pines to come out on the road once more after 1hr (from the village). Go straight across and into the pine forest on a very rough track (E00246439 / N04436655; 1200m; frequent red and yellow squares). NOTE Keep a sharp lookout for the waymarks as you start the climb into the forest. As you pass one, it is often not possible immediately to see the next one and the line of the path is often half-buried in pine needles. Be careful, especially around the 35min mark, not to stray too far R or you will find yourself approaching a large stream gully with no sign of a path. Turn L on the track that runs behind the modern house. Follow it up to join the main track and continue NW for about 30min, ignoring a L turn down to the Asprórema stream. Ford a stream and the little used track begins to climb. On the first R bend above the ford by a stand of fir trees you come to a once-substantial stone house (E00289028/N04340635; 1044m; 4hr 45min). Continue along the track passing a couple more abandoned but solid stone houses until it comes to an end at E00288704/N04341237; 1152m). Leave the track and climb R up the earthy bank (E00288770/N04341472), then turn back L. The path is reasonably obvious, zigzagging up beneath big open firs to reach the three ruined cottages of Sfirí (E002887886/N04341453; 1301m). The firs are thinning out here. There are a number of overgrown and aged fruit trees, a sure sign of former habitation, but no sign of a water source. Keep straight uphill from these ruins for a few minutes. For 20 to 30 minutes from where the trees end the path is very unclear in the unkempt grass and encroaching scrub. You need to get on to the spur directly above Sfirí. The old path seems to have swung out to the L before curving back R above a thicket of young firs and climbing up on to the spur from here. You reach the spur line at E00288991/N04341638 (1417m; 6hr 30min), clear of all the trees. The best thing for the moment may be to clamber directly up on to the nose of the spur from Sfirí, making your way as best you can; it should not take more than 20 to 30 minutes from Sfirí. From here you continue up the ridge bearing NNE to the 1700-metre contour. The going is easier from here on; you are clear of the trees and traversing N and NNW across the flanks of point 2062m to reach the Delidhími col in around two hours, about 4hr total from Maria's house (8hr 30min). For Leondíto, drop down from the col almost due N, keeping to the spur that divides the two gullies opening below you. After about 10min you pass a water trough L and carry on down to meet a clear transverse path (E00288920/N04344500) crossing the grassy slopes just below the 1700m contour (9hr). Turn L or W on the transverse path. Cross a dry gully and bear R along the opposite flank, then up and over a sharp little spur, cutting back L down a good rocky path on the W flank to the shallow gully below. Here, bear R and down to the shepherds’ hut at Lakómata (E00288364/N04344572; 9hr 30min).There is a spring here and it is a good place to camp if there are no dogs in residence. From Lakómata, follow the track W for 30min beneath the distinctive horn-like peak of Salayiáni, passing a spring on the L, to a second sheepfold with a solid little cottage on a piece of level ground at the locality known as Mégas Stanós (E00287091/N04346821; 10hr). Mégas Stanós makes a good campsite too, as long as there are no dogs in residence. A second advantage is that the shepherd who brings his sheep here in summer speaks very respectable English; his name is Yiánnis Makriyiánnis. Bear R at the fork shortly after. The track contours N along the slope for about 600 metres, before zigzagging precipitously down into the woods at a locality called Niáles. At the bottom zigzag (10hr 30min), a disused track comes in from the gully to your R; this is an alternative route from Lakómata, marked on the map but very overgrown with bracken. From Niáles, continue down the track to arrive in Leondíto in about 1hr 30min (12hr). Head N along the road from the square with its 900-year-old plane tree. On the L just past a walled spring and opposite the church (R below the road), a track cuts up L to a large new house. Turn R along the path that follows the fence enclosing this new house. You come out in a rough field with a ramshackle hut. Pass it and, bearing L, you enter the forest. Do not lose height. The path to the monastery was obviously once a major route for pilgrims. For several years, the word has been that the path is impassable. If anyone tries to tell you that today, pay no attention. We cleared and marked the tricky second half in 2017! The path improves as you continue in and out of small gullies and over intervening spurs, sticking pretty much to the 900–1000m contour except for the last stretch where, from a natural belvedere at E00286054/N04349226, you gradually lose about 100 metres in height, dropping below the fir-line down into a deep little gully. Cross over by a large plane tree before climbing back R and steeply up through trees and across an expanse of stable scree. Just before you reach the monastery (Moní Spiliás; 13hr), spectacularly perched on a crag above the Koumbourianítikos river valley, you pass a wonderfully powerful spring. Do not miss a visit to the beautiful monastery church. Tim Salmon first visited Greece in 1958. He has lived and worked in the country, visited countless times, written and translated books and articles, and made a film about shepherd life for Greek TV. 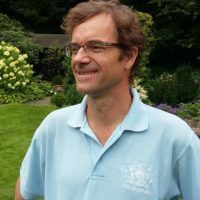 Michael Cullen was born in Greece and spent his childhood there, returning in 1990 to set up his own trekking business. 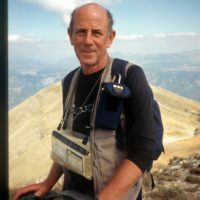 He has spent most of the last fifteen years researching and leading hikes throughout the country, as well as compiling walking guidebooks and accommodation websites. What’s the difference between walking, trekking, hiking and backpacking?